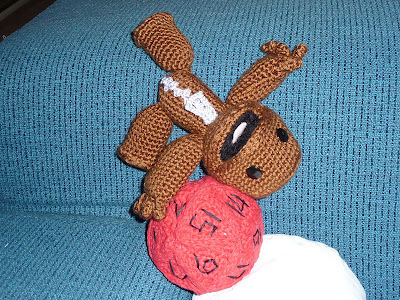 Finding myself in a chocolate and Animal Crossing-induced stupor this past Saturday night, I decided to do something semi-productive and started working on an improved Sackboy doll. I wanted to construct the head differently so it would have a circular, flat top, a true mouth, and a base that was wider than the forehead. 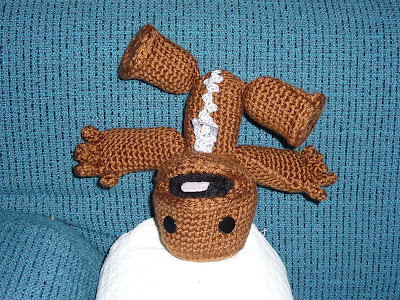 The original pattern I used for V.1 of Sackboy couldn’t accommodate these things, so I just did it my own way. I’ve made enough crochet cat toys in the past two months to have a good idea of what needed to be done, so I wasn’t too concerned about messing things up. Besides, crochet is a pretty forgiving craft–it’s a lot like sculpting in yarn. 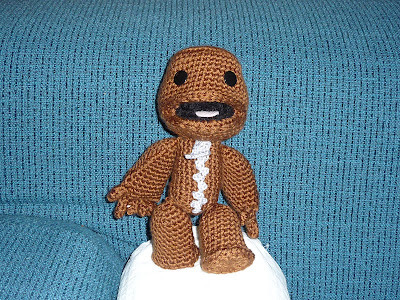 So here is version 2 of Sackboy! 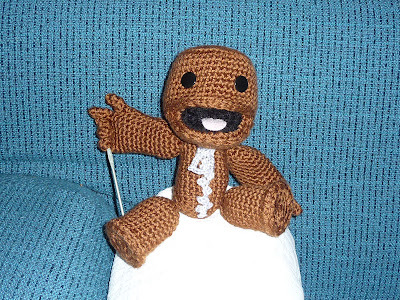 He is an inch or two taller than the version 1, made out of a darker yarn to better match the character from Little Big Planet, and is generally more polished and true to the look of the in-game Sackboy now that I am more familiar with RichmondArt’s pattern. I opted for a fake crocheted zipper and pull made from silver twine since a) I am too cheap and lazy to get to Joann’s for a real zipper, b) I had already stitched the center front of the body closed, and c) I don’t want to risk the arms of the doll getting snagged on a real metal zipper and getting all snarled and nappy. My next version will be a “Spockboy” version for a co-worker who loooooooooooves the Trek. Stay tuned! This entry was posted in Crafts, Games. 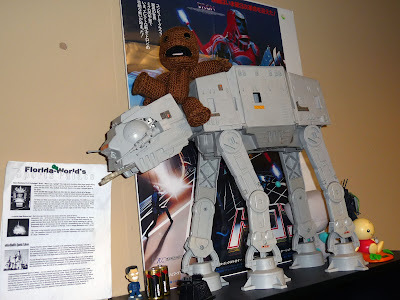 Love your sackboy Maggie! Hubby and I just started playing LBP after FINALLY turning in our very expensive (in hours) WoW armor. These sackboys are perfect! Do you have any plans for these, or do you just do them on your own?